I sat eagerly on the edge of my small plastic seat in the back of a school gymnasium in the outskirts of London. After months of reading about “The Bounce” online, I was about to experience the show live. I watched as the performers, stage manager, musician, and director all made eye contact and gave each other a silent nod that meant: “begin.” The doors burst open loudly, as a performer named Rachel entered, pushing a wheelchair in front of her. A small girl named Ainsley sat restlessly in the wheelchair and gaped at the colorful wonderland around her. The gymnasium, as Ainsley knew it, had been transformed. There were two larger-than-life black and white trampolines set up in the center of the space. Large projector screens loomed above and new colored lighting cast a glow on the scene around her. A hidden machine puffed out sweet smells nearby. Ainsley had entered into the world of Oily Cart: a world that was designed with her in mind. Rachel cheered, “Hello everyone, this is my friend Ainsley!” and everyone in the room echoed, “Hello Ainsley!” Rachel wheeled over a machine, which hoisted Ainsley up out of her wheelchair and gently set her down onto one of the trampolines. Rachel guided Ainsley onto the middle of the trampoline and slowly started to bounce. Ainsley’s concerned face broke out into a wide smile, as she moved up and down, her arms flying, and her high-pitched giggle filling the air. 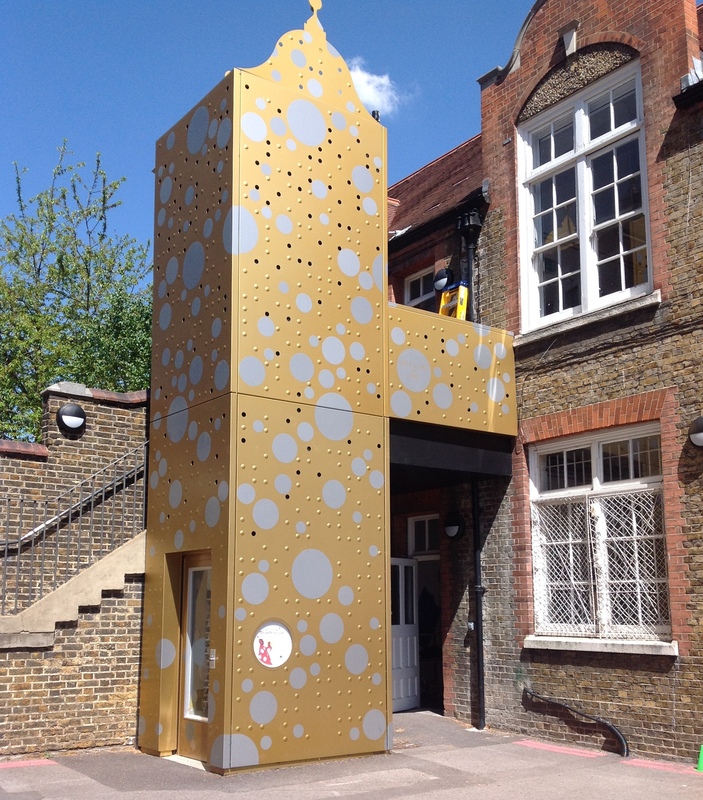 In May of 2015, I had the pleasure of traveling to London to observe the practice of Oily Cart Theatre during the final previews and first week of touring performances of “The Bounce,” their latest show designed for students on the Autism Spectrum and Profound and Multiple Learning Disabilities (PMLD). As the Associate Director of Education of New York City Children’s Theater, I traveled with an agenda: to learn how Oily Cart devises and performs theatre for an audience of students with special needs. I aimed to learn from Oily Cart’s pioneering model in order to create a show for my company that will tour to New York City schools. Questions that guided my research included: How do you prepare the audience for the performance? How do you train your actors to interact with the audience during the performance? How do you choose the themes of the shows? How do you use lighting, sound, or props to set up the space to meet the sensory needs of the audience? I uncovered answers to each of my questions through many different gateways: interviewing Oily Cart staff, designers, and company members; researching in the company archives and reading their “social stories”; and most predominantly, by experiencing the intensely moving interaction between the performers and audience members in thirty performances of “The Bounce”. The strongest theme of “The Bounce” is the celebration of the audience member. Since the show is only performed for two students at a time, each student is each given an incredible amount of personal attention and care. 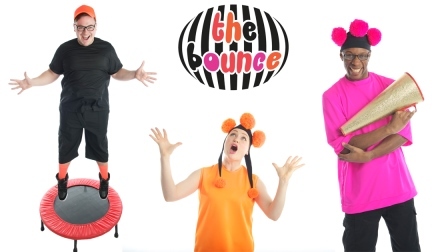 “The Bounce” is divided up into a series of phrases, which include songs with instructions for the accompanying activities (“everybody bounce, bounce, bounce, up and down), and sensory exercises. Although there is a set script, each show is different from the next because the structure is dictated by the audience member’s desires of how to experience it. 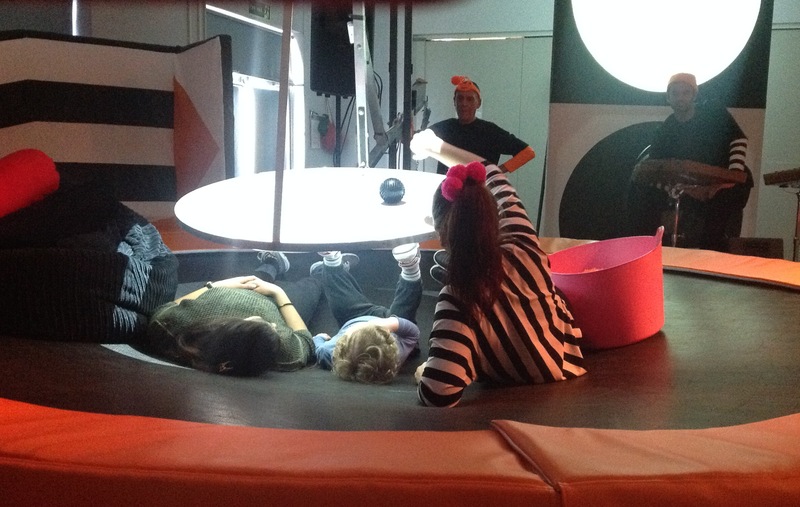 If an audience member walks into the room and doesn’t even want to go on the trampoline, the performers create a new space for them where they can interact with sensory objects. I was continuously inspired by the performers’ abilities to read and interpret the students’ needs in order to engage them fully from moment to moment. My favorite part of “The Bounce” is when the stage manager carries over a camera with a live feed that projects the image of the audience member onto the three huge projection screens above. At this time, the performers all sing a beautiful song with the audience member’s name in it, and a performer cheers, “Look Ainsley, you’re on the screen!” This moment in each show never ceased to move me deeply. In addition, I was inspired by the way that Oily Cart manipulates lighting and sound to engage the audience members throughout “The Bounce.” I was particularly excited by their use of light to draw perspective: certain parts of the show led the audience members to look up at the projection screens, and other parts led them to look down below at the moving LED lights running under the trampolines. There was a live musician playing an Iranian instrument called a Sentur throughout the entire show, punctuated by moments of silence and shared deep breaths that provided transitions between sections. On the four days that I spent in schools touring “The Bounce” with the company, I interviewed the teachers and administrators who hosted the performances. I learned that before Oily Cart arrives at a school, they send them packets of information: “An Introduction to Carers”, and social stories for the students which include activities that teachers can use to prepare their students to effectively experience the show. I observed many of these materials posted all over the school’s bulletin boards. Between performances and on the train home, I interviewed a few of the Oily Cart performers about their training and their favorite experiences of performing in the shows. I also interviewed the Musical Director and co-founder Max Reinhardt about the history of the company and his process of creating music for each show. Although my week with Oily Cart was spent mostly on tour with “The Bounce” performers, I spent two wonderful days at their offices interviewing their staff and researching in their archive. 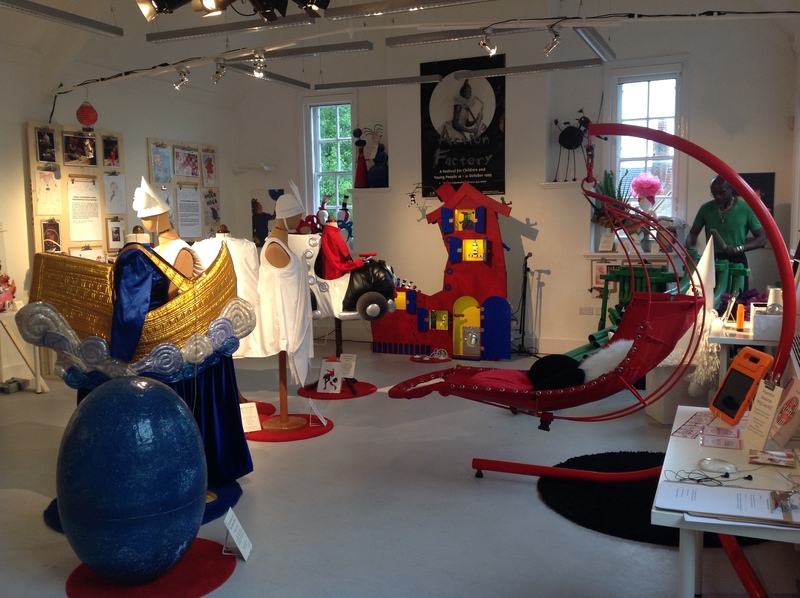 My trip also coincided with the opening of the Oily Cart design exhibition, as part of the Wandsworth Arts Festival, so in the two days leading up to the opening, I joined the Head Designer Amanda Webb in preparing for the design exhibition and helped her to create a family-friendly scavenger hunt for the tour. During my time both in the office and on tour with the company, I had many conversations with Artistic Director Tim Webb. On one of my final days, I asked him for his guidance in creating our new show in New York and he gave me tangible advice: recognizing the importance of music and rhythm, keeping the vocabulary simple, finding ways of supporting verbal language through the use of objects and signing, and using a sensory rubric to make sure that you are engaging the audience through more than one sense at a time. I also spoke to Tim and his colleagues about funding and program assessment, which proved to be very valuable knowledge to bring back to New York City. I had an amazing time touring with the Oily Cart company. 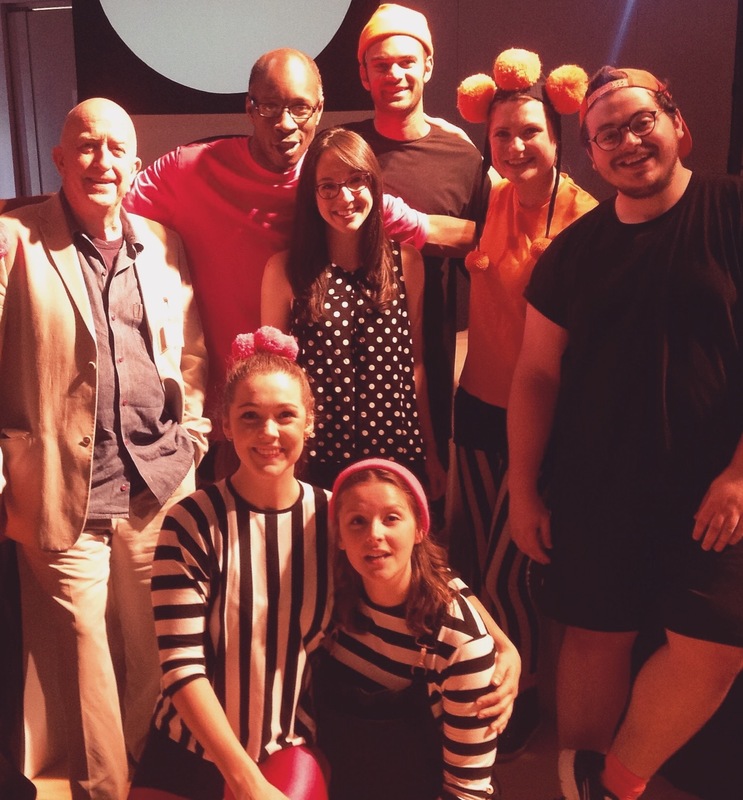 Here I am pictured with Tim Webb, Artistic Director, and the cast and crew of “The Bounce”. Now that I am back home, I have presented the details of my trip to the NYCCT staff and board and am busy planning the creation of our own show. I feel invigorated and enlightened by my time with Oily Cart, and I’m excited to use all that I’ve learned to improve the lives of the special needs students in New York City. Tim and his team at Oily Cart taught me that we need to design arts experiences for these students because they so often feel that they live in a world that was not designed for them. By creating art that celebrates these students as individuals, we recognize and validate them as people who deserve to be celebrated. I am incredibly grateful to TYA/USA for awarding me the Ann Shaw Fellowship in support of my trip to London to research Oily Cart’s work. This trip was incredibly inspirational both personally and professionally, and my new knowledge gained from this experience will guide my practice throughout my career. The Ann Shaw Fellowship was developed to support career development opportunities for theatre artists and administrators committed to theatre for young audiences. Since its inception, the Ann Shaw Fellowship has provided funds to assist nearly 40 individuals with travel to theatres and festivals throughout the United States and abroad, for viewing outstanding work and exploring challenging questions related to the field of theatre for young audiences. In 2016, TYA/USA will award one $3,000 Fellowship. TYA practitioners at all career stages are strongly encouraged to apply. You must be a member of TYA/USA to apply. Application deadline is November 2! Click here for more information. UPDATE: In the summer of 2015, Sara and the Director of Education Brooke Boertzel co-created FIVE, an interactive multimedia musical designed to serve students with special needs and the very young. In this immersive show, students follow a puppet named Piper as he visits all five boroughs of New York City to learn about his five senses. FIVE engages students through videos, live music, puppetry, and sensory objects. Sara Morgulis is Associate Director of Education at New York City Children’s Theater and Director of Education and Outreach at Actionplay. She earned her MA in Applied Theatre at CUNY. She highly encourages members of TYA/USA to apply for the Ann Shaw Fellowship.